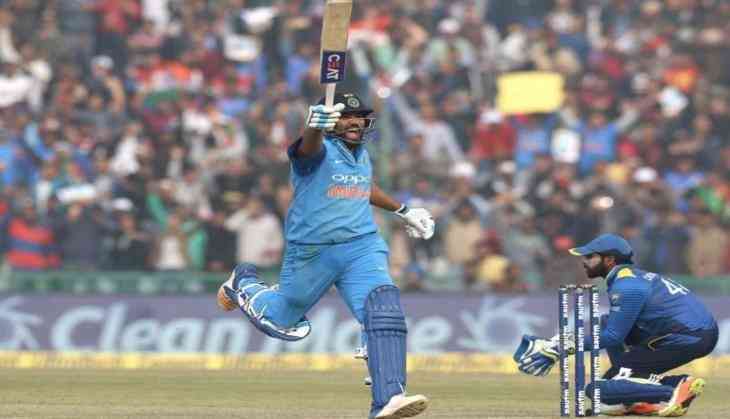 In yet another explosive inning from Indian skipper Rohit Sharma, team India managed to seal easy victory on the second match of T20 series after defeating Sri Lanka in a one-sided match in Indore's Holkar Cricket Stadium. After losing the toss, team India set a mammoth target of 261 runs. Sri Lanka team in response to which went all out for just 172 runs and India match won by 88 runs. Sri Lanka's Upul Tharanga (47) and Kusal Perera (77) fought for their team but all went in vain. For Team India, Yuzvendra Chahal has grabbed 4 wickets for the second consecutive time. Rohit Sharma got the man of match award for his stormy innings. Earlier, while batting, Team India lost 5 wickets in 20 overs and set target of 261 for Sri Lanka to win. From Team India, Rohit Sharma equaled the world record of the fastest T20 century with a century in 35 balls. Rohit scored 118 runs in 43 balls. Apart from Rohit, Lokesh Rahul played a brilliant innings of 89 runs in 49 balls, while Dhoni scored 28 runs. The joint fastest T20I century! Rohit with Lokesh Rahul started with aggressive approach from the start. Both of them shared 165 runs for the first wicket in just 12.4 overs. This is the biggest partnership for India's first wicket in T20. Rahul missed his second T20 century with 11 runs.